Donate today to help refugees like Ella who need life-saving care. The world’s forcibly displaced population remains at a record high, with war, conflict and persecution increasing the number of displaced people to 68.5 million individuals — as many as the entire population of Thailand. More innovative and comprehensive approaches are required to address this situation. The global population of forcibly displaced people has remained at a record high. The current needs of refugees far outweigh the available resource. 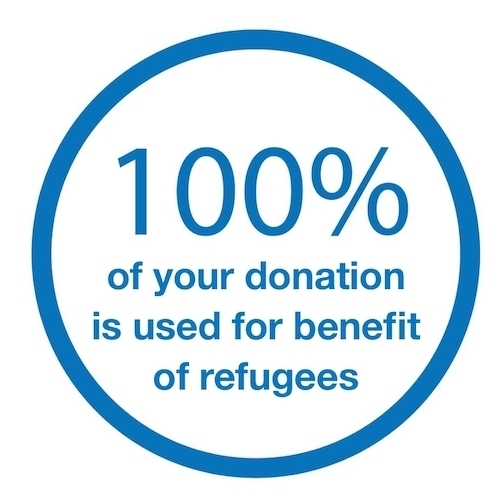 Making a commitment to donating to ‘NAMJAI FOR REFUGEES’ to enable UNHCR to deliver essential services to meet the basic needs of refugee families: shelter, clean water, clothing and health services. Water: Provide water and sanitation services to millions of people in camps, outside of camps and in urban settings. Clothing: Provides Core Relief Items kits include essential household items. Shelter: Provide a family tents or materials to make a simple shelter to protect refugee families and shelter them from harsh weathers. Health Service: Providing a health service for refugee’s family who forced to flee is a major priority. We work closely with partners to provide health service support to refugees around the world.